Hi guys! I hope you are all having a super week and that you are feeling good getting back into the swing of things after the holidays! Here is a simple and quick recipe that you won't be disappointed in, if you are a coconut lover like me! The center of this chocolate is what a chocolatier would call a ganache or fondant. It's thick, creamy and buttery! And then dipped in milk chocolate! People will think you went to a chocolate shop to buy them! Enjoy! Mix all of the above ingredients for the filling (fondant/ganache) together until thick and creamy. 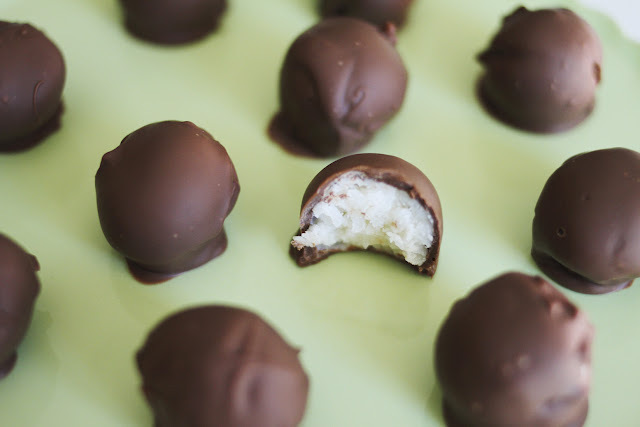 Store in an airtight container in the fridge to firm up before rolling into balls and dipping in melted chocolate. For the chocolate, I used guittard milk chocolate chips. I put 2 cups of chips in a microwaveable bowl and melted for 30 seconds. Then I stirred them a bit. Then back in the microwave for another 30 seconds. Then stir. Repeat this until chocolate is perfectly melted. Add a teaspoon of vegetable oil and stir well. Now your chocolate is ready for dipping! Store finished truffles in the fridge. Take out 15-30 minutes before serving. Yyum! I am obsessed with all things coconut! Mmm, these look divine! Truffle always seem like they're made of magic to me - glad to see it's not as tricky as it looks!